The New York State Office for People with Developmental Disabilities (OPWDD), the entity that provides the funding and regulates the provision of Medicaid Service Coordination, plans to transition Medicaid Service Coordination and Plan of Care Supports (PCSS) to a new model of service delivery called Care Coordination. The conversion to Care Coordination is planned to take place on July 1, 2018. On that date Catholic Charities and other similar agencies will no longer be able to offer MSC services. However, you or your loved one will be given a choice of several different levels of care coordination services to receive, and which Care Coordinating Organization (CCO) you prefer to receive these services from. Service Coordinators will plan visits in the next couple of months, most likely April or May, to assist anyone receiving CCDS Service Coordination in choosing a CCO. At this meeting, you will be asked to choose both the level of service you want as well as the CCO you want to provide those services. The State has awarded preliminary approval to several CCOs to begin planning for operation. In our area, you will have a choice to enroll in one of three CCOs: Care Design New York (caredesignny.org), Life Plan (lifeplanccony.com), or Tri County Services (tricountycare.org). We strongly suggest that you familiarize yourself with these agencies prior to the visit from your service coordinator. Catholic Charities Disabilities Services has partnered with Care Design New York. 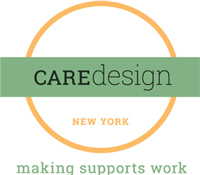 This means that our current service coordinators will be offered positions with Care Design New York. If you want to keep your current service coordinator, and if the service coordinator decides to move to Care Design for employment, you can most likely keep your service coordinator if you choose Care Design. However, you are entirely free to go with another CCO if you want. Between April and May of 2018 you will be approached by your service coordinator to choose both the level of services you want and the CCO you want to provide those services. Service Coordination will no longer be offered after July 1st so you will need to choose something different. We urge you to educate yourself as much as possible. Visit OPWDD's website at: OPWDD.NY.Gov and read the letters below from OPWDD's Commissioner. View the Care Design NY video below. Contact someone in our Service Coordination department at (518) 783-1111. Check out the Overview and FAQ below. As many of you already know, the Office for People With Developmental Disabilities (OPWDD) is making an important improvement to the way services are coordinated, known as People First Care Coordination. The Medicaid Service Coordination (MSC) program which is currently used to coordinate services will be replaced by a new and improved program called Health Home Care Management. Health Home Care Management will continue to provide the service coordination that people currently receive, and will also provide coordination of other services, such as health care and behavioral health supports. Care Coordination Organizations (CCOs), new entities formed by existing providers of developmental disability services, will coordinate all the services a person receives for their developmental disability, as well as the coordination of health, wellness, and mental health services through one individualized Life Plan. The new organizations will be staffed by Care Managers, and to maintain existing relationships as much as possible, in many cases the new Care Managers will be current Medicaid Service Coordinators who will receive additional training for this new role. Care Managers will help coordinate services across systems, including OPWDD, the Department of Health and the Office of Mental Health, providing people with developmental disabilities, and their families, with one place to plan all of their service needs. There will be no changes to a person’s supports and services as this transition from MSC to Health Home Care Management takes place, unless changes are requested by the person receiving services, or their decision-makers. Health Home Care Management should not be confused with Managed Care. Managed Care will be offered statewide to people with developmental disabilities at a future date. People who choose not to receive comprehensive care management can choose to receive Basic HCBS Plan Support which will also be offered by CCOs. Basic HCBS Plan Support will be a very limited coordination option, similar to Plan of Care Support Services (PCSS) offered in the current system. People currently receiving supports and services through OPWDD will be hearing from their service coordinator between April and July with more information so they can choose their CCO, and whether they would like to receive Health Home Care Management or Basic HCBS Plan Support services. We look forward to helping the people we serve achieve their desired outcomes through this improved service. Please check out the video below of an Individual and Family Forum recorded session explaining the transition of Medicaid Service Coordination Services to Care Management Services. What? The New York State Office for People with Developmental Disabilities (OPWDD), the entity that provides the funding and regulates the provision of Medicaid Service Coordination, plans to transition Medicaid Service Coordination and Plan of Care Supports (PCSS) to a new model of service delivery. Medicaid Service Coordination and PCSS currently provided by agency providers, like Catholic Charities Disabilities Services (CCDS), will move to new providers known as “Care Coordination Organizations” (CCOs) or ”Health Homes” (HH). Why? In order to comply with federal regulations/guidance, OPWDD has agreed to restructure the delivery of Medicaid Service Coordination and PCSS to meet the criteria of “Conflict Free Case Management.” Thus, Medicaid Service Coordination and PCSS will only be provided by organizations that do not provide other Medicaid Waiver Services, such as Community Habilitation, Waiver Respite or Residential services. When? This change will occur on or about July 1, 2018. What can I expect? Medicaid Service Coordination and PCSS will be provided in a manner similar to how it is currently provided. Currently, services for people with developmental disabilities are coordinated by Medicaid Service Coordinators (MSCs). The transition of Medicaid Service Coordination to Care Coordination will have as its foundation the creation of Care Coordination Organizations (CCOs). CCOs will coordinate a variety of healthcare, wellness and developmental disabilities services to achieve a holistic and integrated approach to meeting an individual’s full range of needs. Your current Medicaid Service Coordinator (MSC) will be offered employment at a CCO as a Care Coordinator/Care Manager. Plans are being developed for our CCDS MSCs to be hired by a newly created CCO in the Capital District. You may likely be able to keep your current MSC if you wish in their new role as a Care Coordinator/Care Manager. Will my family member or I have a choice? We believe that individuals will be initially enrolled into the CCO that is accepting the Medicaid Service Coordination staff as employees from our agency. If you are not satisfied with the services from the CCO you can select an alternative, although we anticipate that the CCO will be a high quality service provider. OPWDD has indicated that there will be at least two CCOs in each region, so you will have a choice regarding which CCO will ultimately provide you or your family member with Care Coordination/Care Management. How are CCOs being developed? Multiple agencies, such as ours, are joining to create these new organizations. CCDS will have input into their development and initial operation. CCO/HH applicants must demonstrate they are controlled (at least 51 percent) by one or more non-profit organizations with a history of providing or coordinating developmental disability, health, and long term care services to persons with intellectual and developmental disabilities(I/DD). Where can I get additional information? Our Medicaid Service Coordinators have been made aware of what we know, and will do their best to answer any questions you may have; however, they do not have comprehensive information because decisions are still in the process of being made by OPWDD and by the CCOs. As more information becomes available, we will share it with you in further correspondence as well as periodic meetings that we will hold. Finally, the OPWDD website (OPWDD.NY.Gov) offers a great deal of information on this and other transitions. In closing, please be assured that we will continue to provide the same quality of services you have come to expect as the system goes through this transition. Please click the link below to download the copy of the letter from March 6, 2018 updating you on the MSC services transition. Please click the link below to download a copy of the letter sent out October, 2017 explaining this transition.